Amit’s aim is to organise a unique and special journey for you; a trip that will suit your schedule, your budget and your interests. The information below will help to answer some of your questions about hiring your car and driver through India Driver Tours. A professional personal driver with enough English speaking experience to answer questions, share general knowledge about local life, customs and culture, and provide you with excellent customer service All fuel costs, parking, state and toll taxes Driver’s meals and accommodations. Your meals and refreshments Entry fees and tour guides to monuments and other tourist sites Driver’s tip – a customary gratuity based on the quality of service. All cars include air conditioning. The car selection is based on availability and tour group size. Note: We do not charge a flat rate per day. Our price is based on a combination of the number of travel days and kilometers. This way we can create a travel itinerary that best meets your interests and budget. In addition to Car + Driver (as described above) you may like us to arrange your hotel accommodation. The most popular choice is to stay in Midrange rooms. They are neat and clean and include air conditioning, television, a private bathroom with western style toilet and hot water. Complimentary breakfast is also included. Your tour quote will include hotels in the Mid-range, unless otherwise requested. Upgrades are available at an additional cost. If your travel plans through India include train or airline travel, you may choose to make your own bookings. However, we are happy to make these arrangements for you. We require advance payment for most train and airline reservations as these fares are non-refundable purchases. Half of the tour price is payable at the start of your tour, and the remaining balance can be paid at any time before the end of your tour. Payment is in cash in Indian rupees. Driver’s tip should be passed directly to your personal driver. We require advance payment for non-refundable train and airline bookings, as well as some hotel reservations and/or other special arrangements. If you choose Option 1 (Car + Driver) no advanced payment is necessary unless your tour begins outside New Delhi. To reserve a Car + Driver + Hotel tour a small advance will be required to guarantee your bookings. (email us for further details). 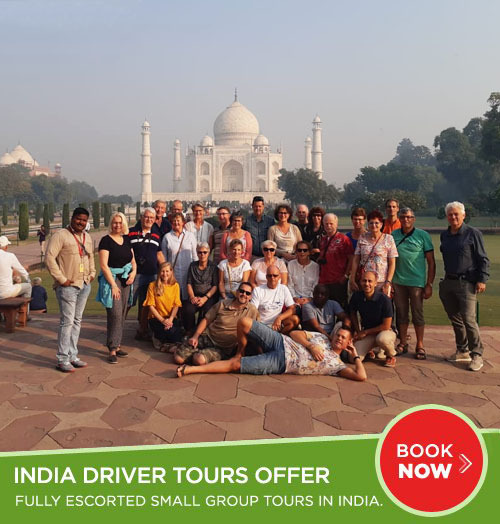 If you have any questions about tour bookings or an enquiry, please fill out our form below and a India Driver Tours representative will get back to you shortly.